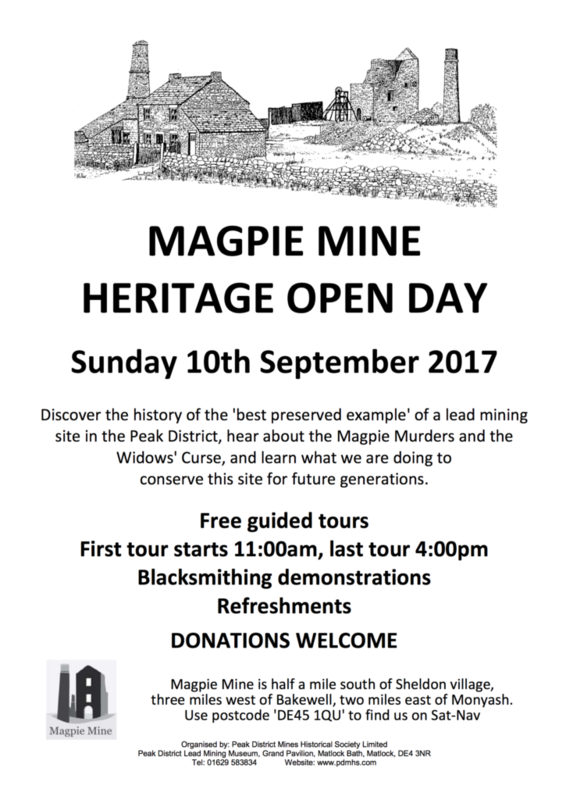 The Society is pleased to announce that one of the Heritage Open Day events in the Derbyshire Peak District will be held at the Magpie lead mine, near Sheldon, on Sunday 10th September 2017. This free event will take place between 11.00am and 5.00pm, with the last tour starting at 4.00pm. No booking required – just turn up on the day. The Magpie Mine is the best preserved example of a 19th century lead mine anywhere in Britain, and was in use from at least 1650 until 1958 – the last working lead mine in Derbyshire. It is now a Scheduled Monument, and is looked after by the Peak District Mines Historical Society. You can read more about the history of Magpie Mine here. There is no vehicle access to the mine site itself, but cars can be left on the road close to the mine. A short walk along a track leads to the mine buildings, which are situated near the village of Sheldon in the Peak District, three miles west of Bakewell, and two miles east of Monyash. The event will be signposted from the A6 at Ashford-in-the-Water and other roads which lead to the site. Use postcode DE45 1QU to find it on sat-nav, or click here to see the location on Google maps. Sturdy footwear is advised because parts of the site are quite rough. The site at over 1000ft above sea level on the limestone plateau is quite exposed, so a wind- and waterproof jacket is also advisable. There is no access to the underground workings of the mine. This event is not suitable for children under the age of 5.